Trendy colors and sleek designs such as taupe, Sienna, and goldenrod are some of the features of modern vacuums. There are many models in the market which caters to different taste and preference, so you can get the best vacuum that suits your needs. Some of the latest models of vacuum cleaners have excellent features, lightweight yet, they are highly efficient. However, there are numerous questions that most people ask themselves before buying a vacuum cleaner. These may include, which is the best vacuum cleaner if I own a pet? If I am allergic, which vacuum cleaner suits me? All these questions and more are answered in the following guide as we aim to equip you with all the information you need before picking a vacuum cleaner from one of our recommended picks. In order to choose the right vacuum cleaner that is numerous aspects that you should put into consideration, such as, the size of the house or home, the number of stairs and the type of floor surface. For larger houses, you may want to consider a more powerful and upright vacuum cleaner, for houses with numerous stair levels you can purchase a lightweight vacuum to aid in easy movement around the different floors. Lastly, the type of the floor plays an imperative role in determining the right vacuum cleaner for these surfaces, for multi-surface homes consider a vacuum cleaner that will suit all the surfaces. 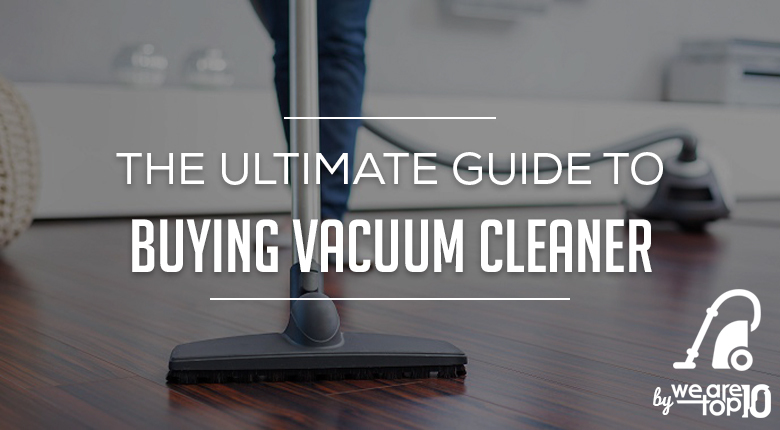 Buying a new vacuum cleaner is not something you do every day. Therefore, it is essential that you put all factors into consideration before making any purchase. This is vital because you will be able to get high-quality products that will last long. After taking into consideration the three factors indicated earlier, there are other features to look out for and this guide will help you to get the best vacuum cleaner. Vacuuming is not a daily activity for most people, and they want a cleaner that does a good job of cleaning the house when they use it. Therefore, here are some of the factors to consider when buying a vacuum cleaner. If you are sensitive to mites and dust or have seasonal allergies. There are vacuums that come with a certified HEPA Filter which traps 99.7 percent of dust and harmful allergens. Most people do not like noisy vacuum cleaners, and if you live in an apartment, where there are babies, you would not want to wake them up. It is essential that you choose a vacuum cleaner that is within 60-65 decibel range, this will be quiet, and you can still handle all your cleaning activities with ease. There are vacuums that are manufactured specially to help clean up pet hair as young children and babies are more prone to allergic reaction from pet hair. When looking for a vacuum cleaner for pet hair, it is important to choose a vacuum cleaner that has at least 12 Amps of power so it can pick up those tiny hairs and also ensure it comes with crevices and special brushes that you’ll need for cleaning purposes. The amount of power consumed by the machine is one of the most important aspects because it shows how powerful it is. If you live in an area which attracts a lot of dust and the electricity cost won’t take a toll on your budget, its best to go with a more powerful option. But some lightweight vacuums are effective too for places which are much clean so the bottom line is to choose a vacuum that can clean surfaces properly without compromising quality. HEPA filters are essential in alleviating dander, dust and other allergens from the air. These types of filters are important in removing all the types of allergens; you are required to replace after every 6 months. These are the most common type of vacuums and can be found in most apartments and homes. They are regarded as the best vacuum for eradicating dirt and dust from carpets, and it can clean large areas with ease and comfortability. In addition, these types of vacuums are good for hard floors and area rugs. Don’t miss read of Top 10 Best Upright Vacuum Cleaner Reviews by Price. Adjustable head height- this is important because some of the cleaners automatically adjust depending on the floor surface and this makes the works easy because you do not have to bend to change the features. Suction control – this feature is useful when using the tool to clean upholstery and draperies. These are the lightest and the smallest type of vacuum cleaners available in the market. They are often cordless and are very convenient for cleaning different areas and doing some tasks around the home. If Handheld is your best fit, then Read our Top 10 Best Handheld Vacuum Cleaners Reviews. We have selected the Top 10 Best Cordless Stick Vacuum Cleaner Reviews as well. Has a powerful battery pack, which allows it to run smoothly and efficiently when working in different areas. These miniature electric models come corded or cordless. If you are that type of person that cringes on the thought of cleaning your house, then the robotic vacuum cleaner is the ultimate option for you. These types of vacuums are programmable and self-propelled, all you have to do is set it to do a specific task, and the vacuum will diligently handle the work efficiently. The robotic vacuum used sensors and built-in features to avoid stairs and other obstacles and it can easily clean furniture and hidden areas. This type of vacuum is ideal for people who are very busy and do not have the time. You can program the robot to handle an activity, and you will find your house sparkling clean. This is the best option for people who clean every day; because the device has, high power and it can deliver top-notch services with high precision. Moreover, if you do not want the task of pushing the vacuum cleaner around you can decide to buy the robot. The vacuum is known to clean carpets and bare surfaces making it one of the exceptional cleaners in the market. Read more on Top 10 Best Robot Vacuum Cleaners Reviews. It can be programmed to run when there is less traffic; therefore, the house will always be clean. Cylinder or canister vacuums are composed of a bag and a motor in a different unit; this is usually mounted on the wheels to aid in maneuvering different surfaces with ease. The canister has to be connected to the vacuum head using a flexible hose. These type of vacuum tend to be very light than any other design in the market, and they can maneuver different spots with ease. It is the best option for cleaning hard to reach spots and furniture. In addition, it can be used to clean drapes and car interiors. Read our Top 10 Best Canister Vacuum Cleaners Reviews. One of the main aspects of the steam mops is that it will help you move from the traditional bucket and mop type of cleaning. Steam mops are the fastest and efficient in cleaning hard floors like wooden floors, the vacuums work by heating water to steam, and the steam is then released via the mop head. In most scenarios, they are referred to as hard floor cleaners, they can remove ground in dirt, and it removes stains effectively without requiring too much work. In addition, it kills bacteria. Steam control- with this feature and capability you can be able to control the level of steam that the mop produces. These are called shop vacuums and commercial garage vacuums because they offer extra power for the professional size of messed. They can get ocean basement dirt, sawdust, and garage spaces with ease. In order to choose the right commercial vacuum, it is imperative to think about the storage area and the mode of use. These are commonly recommended for heavy types of cleaning. Do I require a HEPA filter? As indicated in the text, if you have asthma, any allergy, COPD or any other respiratory condition, it is essential that your vacuum cleaner must be equipped with HEPA Filter. Ensuring that the vacuum cleaner has the filter is vital because it improves the air quality and reduces the allergens. The filter can remove particles such as dust, dander, mite, allergens and other material can be defective to your health. Most vacuums that are equipped with HEPA filters have a modern technology called sealed system engineering. With the sealed system, the clean airbags and filters are essential in alleviating up to 99%of the household allergens. The filtration system of the vacuum is greatly enhanced. Which is the best vacuum? Upright or canister vacuum? One of the general aspects that you need to understand is that the different vacuums work on different conditions perfectly. Canister vacuums are lighter, versatile, and easy to maneuver in different places. Upright vacuums are the best for ground floor rooms, and it has a high capacity and power. Depending on your area of cleaning, taste, and preference, you can choose the vacuum of your choice. Are vacuum cleaners that contain dust bags a better choice for allergic people? The answer ‘yes’ however it is imperative that you select a vacuum cleaner that has a better purifier to ensure that all allergens and dirt are removed. If suffering from allergies keep a dustbin in the house and use a bagless cleanly as the best option. Why is their difference in power and capacity in vacuum cleaners? Even if a vacuum cleaner has high power, it does not mean it has a higher suction capacity. However the amperage of the cleaner determines its ability, and the performance largely depends and on the manufacturer, design, airflow and filtration system. What is the frequency of changing the vacuum bag? Changing the vacuum bag largely depends on the on the type of floor and the use, the bag capacity, and pets among others. Most vacuum cleaners have indicators of the airbag replacement. Pet hair and carpet filter are some of the items that can easily fill the airbag and it is essential to monitor for clean and pure air in the house. How often should I vacuum my house? For most of the people suffering from allergies, it is recommended that you vacuum the house at least twice a week; however, you can vacuum areas with high traffic or areas that are often dusty. For the general public, vacuuming can be done once a week. How many passes do you have to make on the carpet to make it clean? Generally, 7-8 passes the vacuum can effectively clean even a carpet that is heavily soiled. However, the number varies with the type of the vacuum and capacity. Why so many attachments come with the Vacuum cleaners? All the attachments in the vacuum offer box are important because different areas require a different kind of tool. For floors, you can use floor brush and wall brush and for the dust in the drawers’ crevice tool or dusting brush. Which vacuum is cleaner best for allergies? The Dyson Cinetic Big Ball Animal Plus Allergy vacuum cleaner is the best vacuum you can buy for allergy sufferers. It has a revolutionary technology that captures microscopic dust and other allergens which the regular vacuums can’t pick up. Which vacuum cleaner is best for pet hair? Dyson DC65 Animal Upright Vacuum cleaner is best for pet hair removal; it has a reconfigured brush bar- 25% more power drives bristles deeper into carpets, removing more hair. It comes with special brushes and accessories that help in picking up more pet hair to give you fresh air to breathe in. The upright vacuum cleaners are usually the best one for carpets as they have more power and are able to pick up more dust and allergens. The Shark Rotator Professional Lift-Away is our recommended choice for carpets and is the best seller. Which vacuum cleaner is best for bed bug? During our research, we’ve found out that the vacuum cleaners with the HEPA certified filters work best for the bed bugs. We’ve found that the VonHaus 2-in-1 Corded Upright Stick & Handheld Vacuum Cleaner is ideal for bed bugs as they are often found on carpets, and the 2-in-1 feature means you can either use them as a handheld vacuum or in the upright position to sweep bugs off the floor. Which vacuum is cleaner best for hardwood floors? Hardwood floors require extra work to pick up dirt and Hoover has made an excellent vacuum called the FloorMate Deluxe that has spin scrub brushes that counter rotate and scrub hard floors from all angles. It also has a 1.5-liter dual tank system to separate clean and dirty water that makes using this vacuum a breeze.